Planning on hitting the road this winter? Make sure you're prepared for adverse weather conditions or other issues by packing an emergency kit. 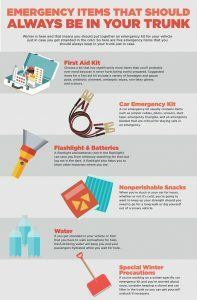 Here's more information on what you should include in your emergency kit. If you encounter car trouble, solid insurance coverage can really help mitigate the issues. Call Blue Marsh Insurance at (610) 590-0152 for more information on the Auto Insurance policies we offer. What do you pack in your emergency kit? Let us know in the comments below.